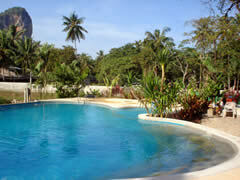 Welcome to Railey Princess Resort situated on Railey Beach. The Princess Resort is in the middle of Railey peninsular..
Princess Resort is one of the better hotels on Railey Beach. Almost on par with Railay Bay and a lot better then Diamond Cave. It is good value. Built on a thin sliver of land in the middle of the peninsular, the aspect is surprisingly pleasing. 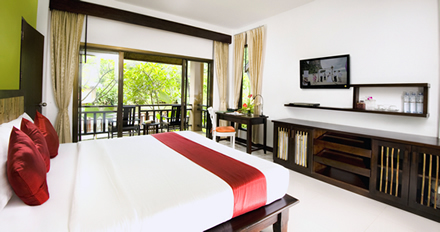 All rooms look out onto the pool, pond and the jungle beyond. Limestone cliffs rising out of the jungle complete the picture. The facilities are great, and the feedback from customers has been good. 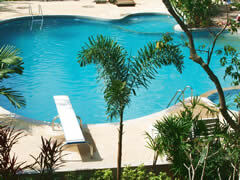 The rooms are airy clean and modern and the staff friendly and helpful. One of the better value hotels on Railey Beach. 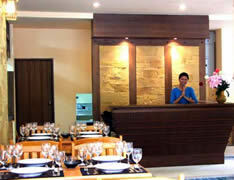 Restaurant, Tour Desk, Conference and banquet rooms, Money exchange and safety deposit box. The large swimming pool is the only one in Railey to have a diving board. It also has a kids pool. Each room has individually controlled air con, local and satellite TV, IDD telephones, refrigerator with mini bar and tea & coffee making facilities. Baby sitting and a baby cot are available on request. The rooms are very pleasant, light, fairly large with good views. The bed is enormous. All in all a nice place to stay. 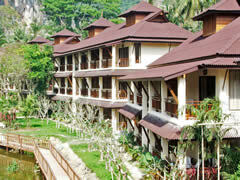 Railay Princess Hotel is right in the middle of the peninsular. There are many different ways to get there, and it can be a little confusing. People are friendly though, and you can always ask for directions... If you are coming from Railay East/ Sunrise side, the easiest way to get there is to walk through the construction of what used to be Ya Ya's. Princess Hotel is directly behind the construction. It is worth mentioning the Waree Spa, because of all the Spa and Massage places around	Railay	this is one of the most pleasing and pleasantly situated. It is built on the water feature as a wooden open old style spa, and it is beautiful in it's simplicity and style. * Children under 9 sharing a bed with parents are charged 200 Baht per day. The restaurant looks out onto the pool and jungle. Glad I don't have to wash all their glasses!